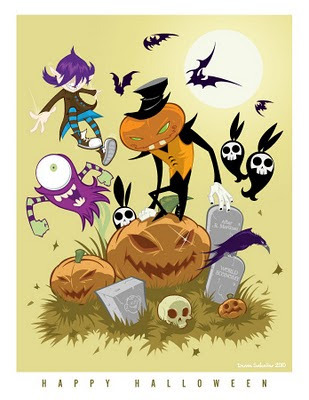 The Tanoshiboy Chronicles: Design & Illustration Blog: Happy Halloween! Hey everyone! I'm happy to share this illustration with you. I sketched out the concept on Tuesday and finished the final artwork last night. These are some characters I designed years ago for a story I named "The Amazing World of Thadeus Crumb". These are Thadeus' friends... Prudence, Manchester, Ampersand and Lenore the Raven. I'd never done a Halloween illustration before, but I really enjoyed it and I think I'm going to make this an annual thing. It was a lot of fun. Hope you enjoy it! Have a Happy Halloween! OK were u thinking of joey and lilly;)haha-me-likes. True to your brand statement: illustrations and design with character. This just-for-fun-for Halloween is eye-catching! HELL YES!!! Love it man!!! Thanks, brother! and thank you everyone. Happy Halloween to you too.. Love ya! It's spooktacular (see what I did there). Serio pedo, I like. I would like you to design something for me, call me sometime. Wow, what a great picture! It's spooky without being scary. I really like it! And I love the name Thadeus Crumb! Very creative. They are cute and definitely have their own style which is distinctive. I really liked your illustration. Do you sell you work on stock sites? This is my first time to you blog. It probably tells me the answer somewhere, so maybe I should look around. Great Halloween image! I'm envious of your creativity and the fact that you can produce it within days! Great work! Wonderful work Dennis! I could envision your illustrations on a magazine cover. Now that you have Halloween down, how about a Thanksgiving illustration? @Rob Hey, there's an idea. Man, I don't know if I could fit it into my workload. A sketch would be more manageable. Look for it in the coming weeks, Rob. Thanks for the idea. Awesome! Super dynamic and love the details!